Each frame is 0.1 seconds apart. There is no breath in the cycle illustrated. The quality of the original film was particularly poor. Frame #1: The right hand has just exited the water. The left arm is stretched fully forward as the body is on its side. Frame #2: The left leg is raised in preparation to kick to balance the vertical forces created by the left arm pressing down. Bending at the left elbow is initiated. Frame #3: Even though the arm presses down the elbow continues to bend. The left foot is at its highest point. Frame #4: Adduction of the upper left arm begins. The knee of the left leg bends to allow the thigh to gain momentum as the kicking action is initiated. The hips start to rotate. Frame #5: The shank of the left leg kicks quickly to counter-balance the sudden increase in arm pull force. This continues to rotate the hips. The head is raised briefly. Frame #6: The left leg completes its kick which contributes to hip rotation. A slight rising of the hips begins. The left arm bends at the elbow to position the forearm and hand so that forces can be applied backward. The right arm enters the water elbow first. The head is lowered back into the water trapping air creating a "pocket of bubbles" which increases resistance. Frame #7: Rapid bending at the left elbow continues. The positioning of the forearm and hand to create large drag forces is demonstrated clearly in this picture. An unusual slight bend at the hips which raises the buttocks is exhibited. The right arm is stretched well forward and continues to be slightly bent at the elbow. The "pocket of bubbles" can be seen under the right armpit. Frame #8: The left forearm and hand are essentially vertical creating the greatest drag force possible. The hips are rolling to the right. The body is returning to a flatter position than in frame #7. Frame #9: The left arm is extending and probably at the extreme of its propulsive effectiveness. The right arm continues to be carried forward with the distinctive slight bend at the elbow. Frame #10: The left hand exits. At this time there is no propulsive force being created. Frame #11: A rapid and direct bending of the right elbow and direct "grabbing" action of the hand is initiated. This is accompanied by medial rotation of the upper arm. The right shank is raised to kick so that a counter-balancing movement for the arm forces can occur. The counter-balancing will keep the hips and torso level. Frame #12: The right forearm and hand have achieved an "elbow-up" position which demonstrates the surface that is developed to produce primarily horizontal drag forces. Adduction of the upper right arm is occurring. A right leg kick is initiated. Frame #13: The right forearm is in a classic "elbow-up" position and is similar to that exhibited by Keiren Perkins and Murray Rose each on one of their arms. The right leg kick is completed while the left leg begins to rise to the surface in preparation to kick. Frame #14: The body rolls past a flat position. The right forearm and hand continue to push back together as the adduction of the upper arm is completed. The left arm approaches entry. In this position the shoulders are flat. An argument could be made that Sadovyi would benefit by having the left shoulder lower in the water at this stage so that the external rotator muscles of the back could be used to complete a longer adduction of the upper right arm. Frame #15: The left arm enters elbow first. The right forearm and hand persist in a vertical plane although the right arm has commenced extraction. The path of the extraction is rounded to conserve momentum. A small left leg kick occurs to counter-balance the left arm entry. Frame #16: The right arm is almost extracted with only the hand being in the water. The left arm begins its downward press as it commences to re-position where it can generate propulsive forces. Frame #17: The stroke cycle is complete and a position similar to that in frame #1 is achieved. In Sadovyi's arm movements there is a distinct absence of any "S-shaped" arm pull pattern. There is little commonality between the left and right arm pull patterns. It would be misleading to claim that Sadovyi demonstrates a particular stroking pattern as each arm pull is distinct. 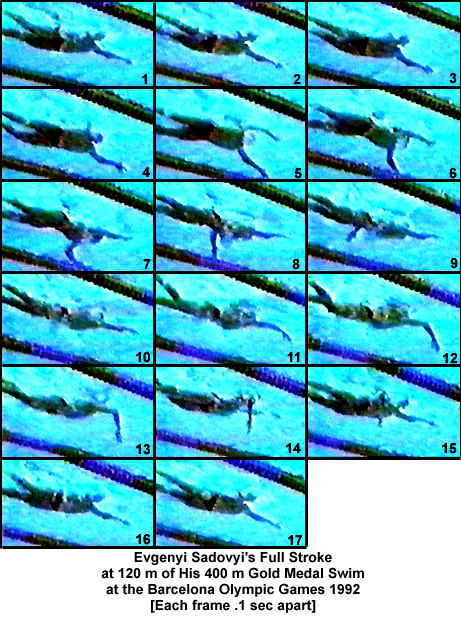 The asymmetry of the arm movements is characteristic of that exhibited by most champion crawl stroke swimmers. The arm entry appears to be an unimportant aspect of the stroke. Both arms enter elbow first almost at a complete stretch. Sadovyi's stroke appears to be relatively "rough." His hips bob up and down (frames #6 and #7) and the head is raised up and down (frame #5), features which should increase resistance. There are brief time periods in Sadovyi's stroke where no propulsive forces seem to be generated.